Οι Jennifer Barth και Chris Bauer, ιδρυτικά μέλη του Smoothmedia, μιας εταιρείας παροχής υπηρεσιών πληροφορικής διεθνούς εμβέλειας, και καθηγητές πληροφορικής και media του πανεπιστημίου του Λονδίνου, επέστρεψαν στην Πάρο στα τέλη του Απρίλη για ένα δεύτερο κύκλο σεμιναρίων με θέμα τις καινοτόμες τεχνολογίες και την ηθική επιχειρηματικότητα. Κατά τη διάρκεια του διήμερου που διήρκεσε από τις 29 έως τις 30 Απριλίου τα μέλη της Ιννοβάρος (www.innovaros.com), εκπρόσωποι του επιχειρηματικού κόσμου όπως και μέλη διαφόρων πολιστικών φορέων του νησιού είχαν την ευκαιρία να ενημερωθούν για τις σύγχρονες τενικές management και τα κοινωνικά μέσα δικτύωσης (social media). Τα σεμινάρια κάλυψαν ένα ευρύ φάσμα γνωστικών πεδίων όπως project management, digital and social media, marketing, analytics και brand development. Μέσα από τη χρήση πρακτικών παραδειγμάτων που προερχόντουσαν κατά κύριο λόγο από το χώρο του τουρισμού οι συμμετέχοντες είχαν την ευκαιρία να γνωρίσουν μια ευρεία γκάμα ψηφιακών εργαλείων που χρησιμοποιούνται για να προβάλουν τουριστικούς προορισμούς και να τραβήξουν την προσοχή εν δυνάμει επισκεπτών. Οι ομιλητές κάλεσαν τους παρευρισκομένους να θέσουν στον εαυτό τους το ερώτημα ‘Ποια είναι η ψηφιακή ταυτότητα της επιχείρησης ή του φορεά που εκπροσωπώ;’ και στη συνέχεια αναφέρθηκαν στη χρήση εργαλείων όπως to Posterous, Storify WordPress που σκοπό έχουν να ενδυναμώσουν την παρουσία ψηφιακών κοινοτήτων στο διαδίκτυο. Οι συμμετέχοντες ενημερώθηκαν επίσης για εφαρμογές όπως Instagram, Audioboo, Bamboozer, SoundCloud και Tagul και είχαν την ευκαιρία να πειραματιστούν μαζί τους κατά τη διάρκεια διαδραστικών εργαστηρίων. Όπως τονίστηκε από τους ομιλητές όσο μεγαλώνει ο αριθμός των φορέων που χρησιμοποιούν τα συγκεκριμένα εργαλεία τόσο αυξάνεται η χρησιμότητά τους. Για το λόγο αυτό μέσα στους στόχους της Ιννοβάρος είναι η διοργάνωση σύντομων σεμιναρίων γύρω από τα εν λόγω εργαλεία που θα απευθύνονται στους φορείς του νησιού. Οι συμμετέχοντες στα σεμινάρια αντιλήφθηκαν επίσης πως η χρήση εργαλείων όπως του Foodspotting (που παρέχει τη δυνατότητα στους χρήστες να ‘ανεβάσουν’ φωτογραφίες από πιάτα που δοκίμασαν σε κάποιο από τα εστιατόρια του νησιού ή, μέσω της χρήσης GPS, να εντοπίσουν την τοποθεσία ενός εστιατορίου) βρίσκεται ακόμα σε εμβριακό στάδιο στην Πάρο. Στο χέρι μας είναι να διαδώσουμε τις παραπάνω τεχνολογίες και να προσελκύσουμε το ενδιαφέρον ενός ολοένα και μεγαλύτερου αριθμού ανθρώπων που είναι συνδεδεμένοι με το διαδίκτυο. Το γεγονός ότι στις μέρες μας η Πάρος περναέι από μια ιδιαίτερα δύσκολη συγκυρία ίσως αποτελέσει επιπλέον κίνητρο για να αναλάβουμε τέτοιου είδους πρωτοβουλίες που σκοπό έχουν να προβάλουν τους θησαυρούς του νησιού μας και να αναδείξουν την πολύπλευρη φυσιογνωμία του. The high-powered energy of the SmoothParos 2 Innovation & Ethics in Tourism Workshop that took place on 29-30 April at the Tao’s Center in Ambelas, proved to be an extraordinarily rich source of cutting-edge techniques and up-to-the- minute information about dynamic uses of social digital media that can be employed to effect dramatic changes in sustainable growth on the island. The community group Innovaros and other participants from businesses and local cultural organisations were left with an overflowing toolkit to help shape the future of sustainable development on Paros. The fast-paced seminar was led by Jennifer Barth and Chris Brauer, directors of Smoothmedia, a London-based strategic advisory and interactive services firm solving digital media challenges for a global portfolio of clientele. Chris Brauer has also been responsible for creating a unique digital media studies programme at Goldsmith University, England. He is co-director of the Centre for Creative and Social Technologies (CAST) and looks forward to expanding professional links with other colleagues between Paros and London as our projects in Paros develop. Seminar participants were given an up-to-date assessment of the shifting social digital media landscape, as techniques and online entities are constantly evolving. Many examples of campaigns, survey and analytic tools used to dramatically and economically affect tourism around the globe were examined. Chris and Jennifer used interactive techniques in which seminar participants tested out these new approaches in practical exercises. Each day we were nourished with a delicious Thai lunch at the Tao’s restaurant and participants excitedly shared ideas about how they could put the new tools to use. SmoothParos 2 bootcamps included project management, creating innovative content in digital and social media, marketing, anlytics and brand development and management. The boot camp that focused on content included a dazzling array of tools, launching with the main question “What is my digital identity?” From there we looked at a variety of channels and aggregators like Posterous, Storify and WordPress to create community engagement. We also learned about Instagram, Audioboo, Bamboozer, SoundCloud, and Tagul and had hands-on workshops to test them out. The effectiveness of these tools is enhanced when more people are using them, consequently one of the ambitions of Innovaros is to run some short workshops on Paros to support others in their use. What became self evident as we learned about tools such as Foodspotting (where you can post pictures of great dishes you’ve enjoyed and, using GPS, locate the restaurant where the dish can be found), or TripAdvisor, is that Paros is very poorly represented. With some concentrated effort, there is a great deal of untapped online potential where the many assets of Paros can be promoted and each one of us can make a significant difference to the Paros ‘brand’, affecting the type and quality of tourism the island attracts. Many in the community have already worked hard to raise the bar in terms of the range and quality of cultural offerings available and collectively we seem to be at the cusp of creating something marvelous. Instead of downsizing our thinking, perhaps it is time to think boldly about who we choose to be and become. Sometimes in the darkest times the brightest ideas are born. That time is now, so let’s invent something better. Working with a dynamic community group is invigorating and exciting, giving us the possibility to sharing the unique strengths offered by each participant, to find new approaches, make space for new ideas and become a living laboratory of ways to move forward. The seminar offered us a glimpse into so many possibilities, and we are eager to implement partnerships with other community groups to take advantage of everything we have learned. One of the key projects that Innovaros is already working on is a digital map with video of some of the exceptional people and locations of Paros. This project has been realised in collaboration with Professor Susan Tennant and visiting students of the School of Infomatics, Indiana University. We look forward to the project’s continued growth and launch. 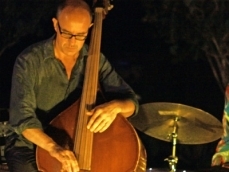 For the second consecutive year The Paros Jazz Academy comes to the Paros Park and the outdoor Archilochos amphitheater on Tuesday July 10, 2012 at 21:30 with the Jasser Haj Youssef Quartet for an evening of oriental jazz. The evening holds great promise as the virtuoso of the viola d’amore, Jasser Haj Youssef weaves a melodic tapestry of Eastern and Oriental Jazz sounds under a Parian summer night sky. His perfect mastery of classical Arabic and traditional repertoire and his knowledge in musicology makes him one of the most promising exponents of the new generation of Arab musicians. Joining him are renowned musicians Gaël Cadoux on the piano, Arnaud Dolmen drums and Gwo Ka and Marc Buronfosse on the acoustic bass. “Four musicians in the crowd, under a patch of blue sky”. The Jasser Haj Youssef Quartet considers itself a symbol of openness to all music. Chants of the Orient, vibrations of the soul, body trance…Mixed music that carries baroque accents to floral covered shores of jazz. The Paros Jazz Academy began in 2011 by Athena Perantinou and Marc Buronfosse in an effort to create a cultural and musical magnet for talented musicians to learn, perfect and play their music in a magical setting such as the island of Paros and consists of a team of experienced teachers and artists, all with international backgrounds, that will be sharing their knowledge and passion for music with students from around the world. For more information on the Paros Jazz Academy please visit their site here. The Environmental and Cultural Park of Paros is located in the beautiful peninsula of Ai Yiannis Detis in the bay of Naousa, Paros and represents a modern example for the development of benign forms of successful tourism practices combining numerous recreational, athletic, cultural and environmental activities which take place throughout the year. The Festival at the Paros Park, from June till October, promotes artists from around the world and local initiatives, encourages cultural and ecological awareness and advocates collective and volunteer participation. I was collaborating with a well known Jazz music foundation to organize a Jazz Summer School on Paros island Greece, trying to build up on event driven tourism, as Paros is just such a great destination! I had the idea of a “music village “ and had set everything in my mind to make this dream happen in Lefkes village, an ideal traditional picturesque village on the top of a hill with fantastic views. My work field as a travel agent would involve mostly taking care of all the organizational bits and pieces. When this collaboration failed due to different reasons, only four months before the event was to be presented, I found myself in a very difficult situation of either trying to find another partner and continue or to quitting the whole idea. I decided to give it a try and had sent an SOS Facebook message to a very kind French musician and also double bass teacher at the Paris National Conservatory of Region, whom I had never met, but he had offered me some time ago his help, after he had seen my FB promotion campaign for the Jazz project then. He is connected to Paros as he owns a house in Naoussa. From this Facebook link exchange Marc Buronfosse, became my partner in the creation of a fantastic music project on Paros island which is unique in Greece, the Paros Jazz Academy and Festival. For the moment there isn’t any other International Jazz Summer School in Greece. 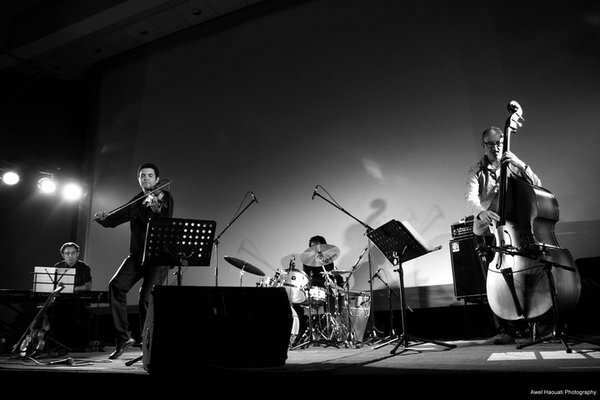 It is an intensive 5 day Jazz music workshop. The experienced teachers and artists are all with international backgrounds and people come from all over the world to participate. 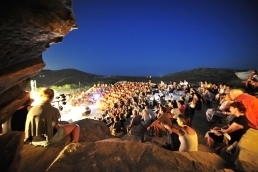 We also organize a Jazz Festival with concerts around the island that attract visitors to Paros. We collaborate with the local Cultural associations/institutions on Paros for presenting our concerts eg.the Environmental and Cultural Park of Paros. We also promote the Parian culture by presenting a Jazz and Parian poetry concert every year in Lefkes village. It is in our ambition to establish a poetry competition by engaging the schools and students of Paros to write poetry for this event. M. Christos Georgousis, a well known writer and poet on Paros is leading this project and already this summer we will be presenting some of the students’ poems in our event. The Jazz composition class students will compose music for the poems presented. We started from scratch to create a sustainable and cultural tourism product that attracts quality tourism on Paros island and we have accomplished it by using the existing infrastructure facilities of the island eg. the community of Paros is supporting us by providing the School buildings of Lefkes for the lessons, and there are many lovely hotels and local restaurants we collaborate with.